Sen. John McCain, R-Ariz., said Trump had "one of the most disgraceful performances by an American president in memory." 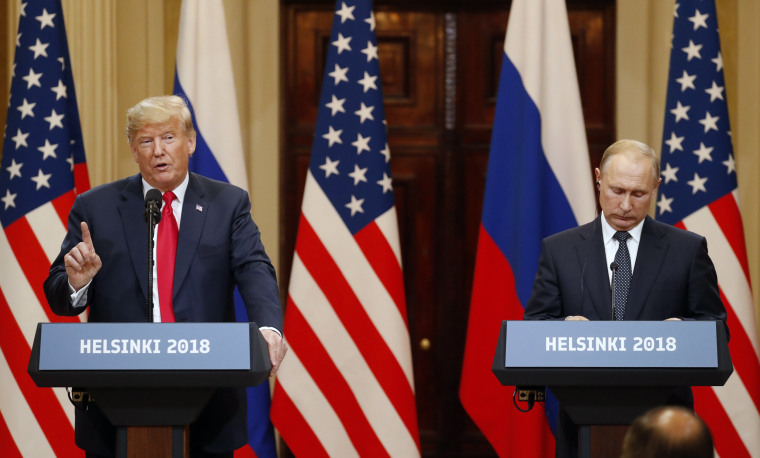 His remarks were met with an outpouring of condemnation from Republicans, Democrats, and even Fox TV hosts, who accused the president of undermining his country's intelligence community while embracing an adversary. Former GOP House Speaker Newt Gingrich, a Trump confidant, called the president's comments "the most serious mistake of his presidency." "President Trump must clarify his statements in Helsinki on our intelligence system and Putin," Gingrich tweeted. "It is the most serious mistake of his presidency and must be corrected—immediately." "I never thought I would see the day when our American President would stand on the stage with the Russian President and place blame on the United States for Russian aggression. This is shameful," Flake said. House Speaker Paul Ryan, R-Wisc., who rarely criticizes Trump publicly, contradicted Trump's equivocations about Moscow's election meddling and said "the president must appreciate that Russia is not our ally." "There is no question that Russia interfered in our election and continues attempts to undermine democracy here and around the world," Ryan said in a statement. "There is no moral equivalence between the United States and Russia, which remains hostile to our most basic values and ideals. The United States must be focused on holding Russia accountable and putting an end to its vile attacks on democracy," Ryan added. "A person can be in favor of improving relations with Russia, in favor of meeting with Putin, and still think something is not right here," tweeted Rep. Justin Amash, R-Mich.
Republican Sen. Bob Corker, chairman of Senate Foreign Relations Committee, said he didn't think it was "a good moment for our country. "Actually, sometimes the president cares more about how a leader treats him personally than forcefully getting out there and pushing against things that we know have harmed our nation, and I thought that's what we all experienced today," Corker said. Sen. Richard Burr, R-N.C., the chairman of the Senate Intelligence Committee, pushed back against Putin’s assurance at the Helsinki summit that his country did not meddle in the election, calling it "a lie" and adding that it should be recognized as one by the president. "Vladimir Putin is not our friend and never has been. Nor does he want to be our friend. His regime’s actions prove it. We must make clear that the United States will not tolerate hostile Russian activities against us or our allies," Burr said in a statement. Mitt Romney, the former Republican presidential candidate now running for U.S. Senate in Utah, called Trump's "decision to side with Putin" over the conclusions of American intelligence agencies "disgraceful and detrimental to our democratic principles." Fox News and Fox Business personalities found themselves at odds with Trump, as well. Abby Huntsman, a Fox News reporter and daughter of U.S. Ambassador to Russia Jon Huntsman, excoriated Trump in a tweet, saying "no negotiation is worth throwing your own people and country under the bus." Fox Business Network host Neil Cavuto also blasted the president for appearing to believe Putin over the assessments of the U.S. intelligence community that Russia interfered in the election, calling Trump's performance "disgusting." "I'm sorry, it's the only way I feel. It's not a right or left thing to me, it's just wrong," Cavuto said. Guy Benson, a conservative Fox News contributor, called Monday "easily one of his worst days as president." Thomas Pickering, who served as the ambassador to Russia under President Clinton, said in an interview with MSNBC's "Andrea Mitchell Reports" that Trump's suggestion that Russia did not interfere in the election is "a breathtaking denial of something that is so obviously true." It epitomizes Trump’s penchant for self-promotion over "defending the national interest of the United States," he said. "The president is putting himself over our country," he said. "Millions of Americans will continue to wonder if the only possible explanation for this dangerous behavior is the possibility that President Putin holds damaging information over President Trump." Rebecca Shabad, Frank Thorp V and Alex Moe contributed.